Located 15 miles southeast of Times Square in Jamaica, Queens, Radisson Hotel JFK Airport is the ideal stopover for guests flying into New York through America’s fifth-busiest airport. Take a five-minute ride to the hotel on our free, 24-hour airport shuttle, and then head out to explore world-famous attractions like One World Trade Center and the Statue of Liberty. The Business Class Room offers upgrades like a complimentary breakfast each morning and a complimentary drink voucher each evening. Satisfy your big appetite in the Big Apple when you stop by Connections, our on-site restaurant and lounge. Enjoy the casual setting and munch on tasty American cuisine for breakfast, lunch or dinner. Our lounge is the perfect place to take advantage of happy hour specials before dinner or share late-night beers and cocktails with colleagues. Queens Museum – Located in the New York Building about eight miles from the hotel, this museum features distinctive art collections and educational programs that represent the diverse culture of Queens. Though the New York Building was erected for the 1939 World’s Fair, the Queens Museum did not become a reality until 1972. Times Square – Walk through one of New York’s most magical places just 15 miles from the hotel. From the flashing billboards to the thousands of faces, Times Square seems to pack the diversity of an entire city into a few blocks. Take time to attend a Broadway performance, browse high-end stores and see NBC’s studios for TODAY, Saturday Night Live and The Tonight Show starring Jimmy Fallon. Citi Field – Experience New York’s all-American side as you join thousands of Mets fans for a baseball game about eight miles from the hotel. Sit back with your ballpark hot dog and a cold beer while you root for the home team. 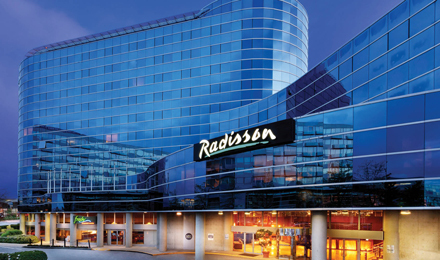 Situated about five minutes from the JFK airport and less than 15 miles southeast of Midtown Manhattan, the Radisson offers a convenient location for business meetings and other corporate functions. Our 5,000 square feet of event space is divided into four meeting rooms, a boardroom and a ballroom. Host a variety of events for up to 300 people, and impress your guests with superb catering and thought-provoking audiovisual presentations. Recharge in rooms and suites with free Wi-FiStylish and contemporary, each of the 385 hotel rooms and suites at the Radisson feels like a getaway from the bustle of the city. After you arrive at the JFK airport, head to your thoughtfully designed home away from home to watch a pay-per-view movie on the LCD TV or to check email with free Wi-Fi. Get a great night’s sleep on your plush mattress, and then brew a cup of coffee in the morning with your in-room coffeemaker. Meet for cocktails and conversation at ConnectionsDelicious American fare and cold beverages are always on the menu at Connections, our on-site restaurant and lounge at Radisson Hotel JFK Airport. Enjoy a casual atmosphere that’s perfect for savoring a laid-back meal after a long business meeting or for making the best of a layover with signature drinks. Indulge in eclectic American cuisine made with fresh ingredients at Connections. Order a shareable appetizer, and then select from a wide array of mouthwatering sandwiches and entrees. Open until 11 p.m., Connections Lounge is the perfect spot for beer, wine or cocktails with colleagues. If you’re visiting our hotel in the summer, kick back on the outdoor patio.